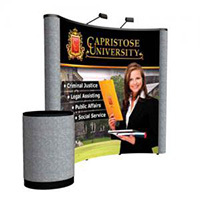 The 8' Coyote Fabric Pop Up Display will create a solid backdrop to highlight your companies message at your events! The Coyote 8' curved Pop Up Display features a concave curved back drop covered with a large format printed mural to attract attention! 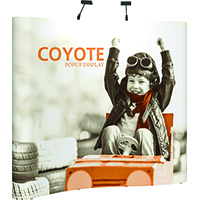 Coyote Straight Pop Up displays also available! Coyote Full Mural Displays offer large format graphics printing across the entire curved back drop for maximum visual impact at your events! 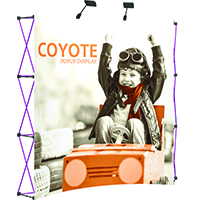 Coyote Straight Pop Up Displays available too! 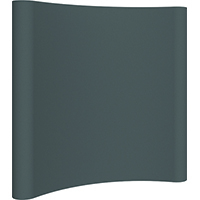 The Coyote 8'Fabric Serpentine Pop Up Display provides a wave-shaped backdrop in your choice of 12 available colors! Shipping case included! 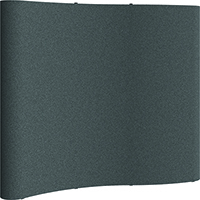 The Coyote 8' Full Mural Serpentine Pop Up Display provides a wave-shaped backdrop featuring your corporate images and message! Shipping Case Included! 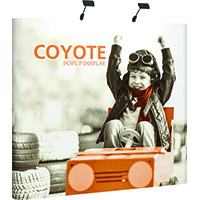 Give your Coyote Pop Up Display a makeover with new Fabric or Graphic panels!